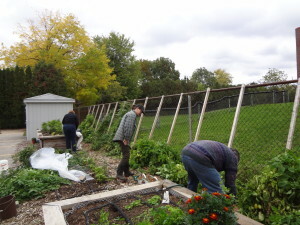 All of the produce harvested from the Harcourt Communal Garden is donated to the Chalmers Community Services Centre’s (CCSC) food pantry at 41 Macdonell Street, Guelph, enabling marginalized citizens of Guelph to receive more fresh, organically grown produce than they might otherwise have access to. There is no one who would deny the importance of fresh fruits and vegetables in our diet or that people who live on the margins tend not to have sufficient resources to afford these for themselves or their families. We know that good nutrition leads to better outcomes for children in terms of learning, growth and behaviour. We believe that supplementing the fresh produce which Chalmers provides is a small but important step towards enhancing food security for all. The Harcourt Communal Garden was first planted in 2011 with three raised beds (4’ x 12’), two on-ground beds (4’ x 12’), and one long on-ground bed (2’ x 80’) along the fence at the western perimeter of the church parking lot. Previously, this strip of land was grassed and unused. In 2012, the Property Committee asked us to take over the troublesome bed outside the pre-school window, and here we planted herbs, rhubarb, currants and garlic. 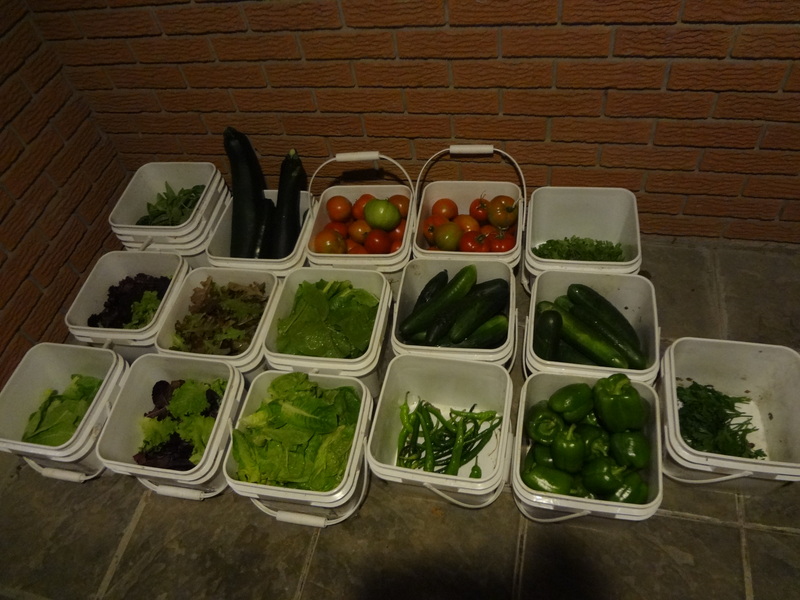 Since 2011, we have harvested in excess of 4,740 pounds of organically grown vegetables, fruit and herbs. In 2012, we took part in a study conducted by a Master’s student in Geography at the University of Guelph. We’ve planted asparagus, installed hoop-houses (mini greenhouses), pre- and post-season to extend the growing season, installed a three-stage compost system to utilize garden waste, and added four rain barrels on the herb-garden side of the building. We staged several events this year which included a Strawberry Ice Cream and Rhubarb Social on June 7 and a Salsa Tasting on September 16, both following 10:30 a.m. services. During Transition Guelph’s Urban Farm Tour on July 21 we invited folks to explore both the Communal Garden and the Orchard and take in a workshop on Container Gardening. 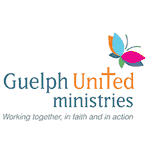 On September 23 we hosted the first annual Salsa Fest in partnership with the Guelph Community Garden Network and the Guelph Neighbourhood Support Coalition. 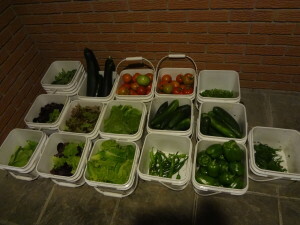 An enormous ‘community salsa’ was created in the kitchen and outdoor activities were enjoyed by the participants. The event in 2019 will be expanded to be more like a Garden Fall Fair. None of this amazing outreach activity could happen without the hard work of dedicated volunteers. We average 18-20 volunteers yearly, which works out to be approximately one work session per month, usually Thursday early evening, in order to deliver the harvest to be distributed at CCSC on Friday mornings. Interested in volunteering? Contact Jill Gill.